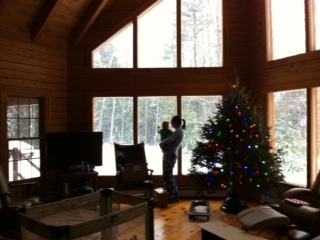 Can there be a better view of the snowstorm, than from inside a warm house with your grandson and daughter? I got to keep my grandson and his family here two days longer due to the snowstorm coming up the coast! Yea! Poem to follow....shortly. My daughter and son-in-law surprised us with a tree while we were out. It was all lit up when we came home. It is a pretty tree and we will decorate it tonight. My son just bought his first house on Friday, and it came furnished. He was working through items left behind and found some Christmas tree ornaments. So we will use them on our tree. How interesting will that be... to use someone else's memories on your tree? Our 16 month old grandson just used a fork, a real metal fork to eat his sweet potatoes. Sigh. I'm loving this week. I think my wrapping is done. Almost. That is, I almost thought "my wrapping is done". I was wrong. I was almost right. I have to bake something. that doesn't mean we've made a bumble? I know lots of people are on Blog Break. I'll probably be off for a week, unless I see something that strikes a chord or a nerve, requiring my blogging attention (such as a runaway mitten). 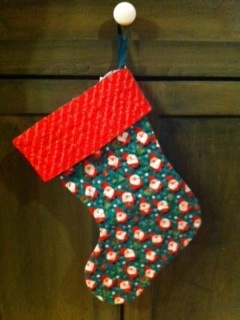 a second stocking was made. And here is a link back to an earlier post about the things vs people in our lives, that reminds me of Anita's post today on Learning to Be Writers. Cherish every moment this season! Remember to tell them you love them. Okay, I know I used these pictures before....but then this song came into my head to go with them. Had to do them again. Only one person saw this post, so here we go again. This is a double deja vu. 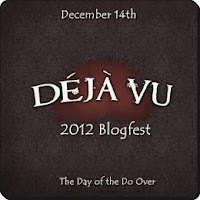 When you are ready...click on the Deja Vu Blogfest and see some oldies but goodies reposted for reconsideration! One more time, now...Everybody sing! We’ll withstand the lowery weather! And now head on over to Jama's Alphabet Soup for more great Poetry Friday links! I just decorated my house for Christmas. I went to the spare room closet and got out our tree and plugged it in. My tree is 18" tall and artificial. We stopped using a big tree the year of our house fire. We bought this little tree for our motel room, our home for 11 months, as we celebrated Christmas there, and now it always reminds us to take delight in the little things. Between our basement flooding the winter before, and the smoke damage, we lost most of our pictures and memorabilia. Our little tree reminds us that we should take notice of the little things, appreciate them, remember everyTHING you have is replaceable, but that everyONE is not. God bless you at this time of year, and each and every day. A few years back, we had a house fire in our present home. The good thing was, no one was hurt. We would have been killed that night if we'd not taken a very unexpected trip over night. Our son, who stayed overnight to care for the pets, would have been killed that night if the tv he'd fallen asleep watching hadn't woken him as it went to static. A TV in our unfinished basement, not turned on, not used for years, but still plugged in from when my husband had had his office in the basement, had randomly burst into flames. Although nothing but the tv caught fire, it made enough smoke to coat everything in our house with a black plastic and electronic slime. The house required cleaning that took 11 months. At any rate, we took up residence in a small inn, or large motel, in town. We had two rooms, a very tiny closet - not your regular sized ones in a motel (but we didn't have any clothes, so who cares?) - and a bath. It was just after Thanksgiving, and we'd been told it would take two weeks to clean the house, so we'd be back in by Christmas. Well, it didn't, and we weren't. So we bought and set up a small tree in our motel room (see picture above) to give it that Christmassy cheer. I sprayed some tree smell around, and voila! Our son, our daughter and our son-in-law were coming for Christmas, but it wasn't going to be like inviting them over to our house. Fortunately, there WAS room at this inn, so we booked rooms for them. When my daughter and her husband arrived two days before Christmas, we decided we could have our Christmas celebration right in the third floor lobby, just down the hall from our room. We could use the decorated tree that was right there. As my daughter and I looked at the tree, we decided it had been decorated quickly, and that the wrapped empty boxes beneath it were getting stale. We set about freshening up the boxes by retaping and repapering some. Then we started rearranging decorations on the tree. Rearranging proved to be too difficult, so before we knew it, we had taken ALL the decorations off the tree and redone the whole thing. Some of the decorations seemed excessive, so instead of putting them back on the tree, we decorated around the lamps on the end tables in the area. As a final touch, we added candy canes to the tree, as we usually have on our own tree, and repositioned the fake gifts. It looked so nice when we were done! And we'd had our mother daughter decorating party even though we weren't in our own home! We met with the guys and headed downstairs to find a "kitchen"....which meant we were going out to look for a restaurant for supper! On our way past the check-in desk the women at the desk asked my daughter and me if we'd had a good time. "Yes?" we said a bit hesitantly. "We were watching you decorating on the monitor!" they laughed. Oh, yeah. Forgot. Cameras everywhere. 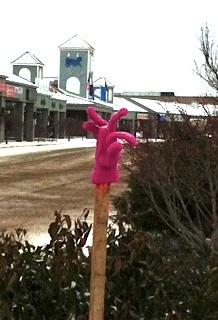 The next morning we waved to the cameras and inspected our handiwork again. We determined that if we moved the boxes to the back of the tree, we could set our real gifts out there in the morning, and put coffee and cups and some sugar cookies out on the end table to snack on. And Christmas morning, that is just what we did. My son had the room next to ours and my daughter and son-in-law had the room directly across the hall. It was almost like home! When we got up, we made some coffee in the motel carafe, grabbed our cookies and presents, and still in pj's we went out to the lobby and had Christmas. A few people passed through, and we wished them a Merry Christmas! We moved back into our home in October of the next year. 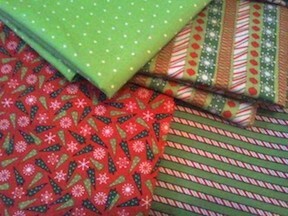 Almost time for Christmas again! Since then, we've had a fake tree. And we've always put up our little motel tree to remind us that Christmas doesn't need to be at home. It can be in a strange place. It doesn't need to be with lots of stuff. It can be with none of your stuff. It doesn't even need to be with family. Though we had our family, we also had new friends at the motel that became like family to us. We had everything we needed...it wasn't much, but it was plenty. This little tree reminds us that we don't need a lot. But this year, I'm wondering. Our grandson will be here on Christmas morning. He's 16 months old. Maybe we need a bigger tree, not huge, just bigger. Maybe it needs to be real, smelly real. Maybe it will remind me that I have a lot. I'm torn. What do you think? 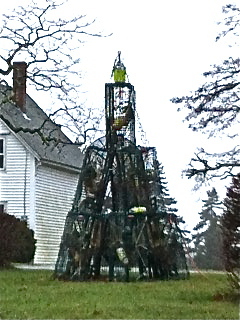 Christmas in Maine... boats, traps and buoys have pretty much migrated inland for the winter months. It's time to decorate... the boats, the traps, the buoys. Ah, the fresh smell of...hm...not evergreen...is seaweed an evergreen? It must be! Now that I think of it, it is green year round. So, the fresh smell of evergreen. Yup. That's what it is all right. Oh, and these were just on lawns. Check here on the Bangor Daily News for an article about the town displays. Enjoy! Now head on over to Robyn Hood Black's place, where she is hosting Poetry Friday! Hey, doesn't this look like a paper in a typewriter? Yesterday I started "The Book". I wrote some more today. I now have 1350 words (besides the almost 1500 I've written prior to this). Maybe that isn't many words to a person who has written published books, but it is to me. I am slowly discovering my characters' characters. As I write, they are revealing themselves. Huh. I'd heard others say that this happens. I'd just never tried writing them into existence before. It reminds me of coloring when I was a child. I imagined that as I colored, things would come to life or become real. They were just waiting for someone to help them out. So I colored and all sorts of things could finally be real - grass, sky, animals, trees. 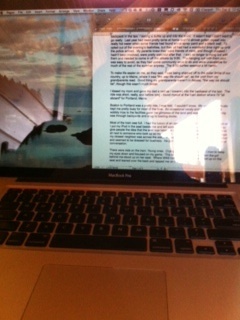 And now I am writing. And as I write, people just come, and they are real because I wrote them. Like a coloring page, they were always there, waiting. But now I've written them into reality. I can't stop in the middle, or they will be upset with me, I'm sure. This is a very strange feeling. I think I like it. But they will have to wait a bit now until tonight or tomorrow. I also have real vacuuming to do. I almost didn't check the pockets. My husband has a cold, so I didn't want to put my hand in his pocket to see if there was anything in there. Fortunately I didn't have to. The weight of the jeans was enough to tell me it wasn't just the normal load. 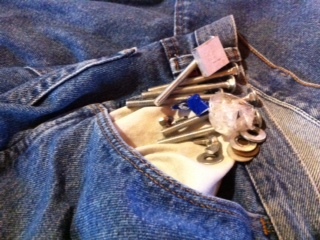 A shake of the jeans told me I didn't want whatever the contents were to make it into my stainless steel washer tub. Unfortunately, it meant I HAD to put my hand in that pocket that has held a snotty, virus filled handkerchief. I carefully unloaded the jean's pocket to find 1 wheat leaf penny, 1 bullet, a scrunched up piece of packing tape, 5 screws, 4 washers, 4 wing nuts and an undefined piece of aluminum. I washed my hands. How do they make it into the laundry room unnoticed? But I've asked that many times over the past 40 years. I always "almost don't check the pockets". But in the end, I always do. And I almost always find the treasures before I wash them. A long time ago I should have started a list of things that have been washed that could have skipped the process. I just didn't know it would have made a book. And lending a hand to reunite love. I'm up on this post. 'Cause you love me the most. 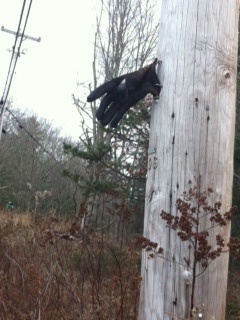 A link to a blog with my sentiments exactly...on gloves anyway. Today we could at last reveal who we were to the other writers in the WRiTE Club Challenge. It was so great to be able to participate in that event. Next year, YOU should try it, too, if you didn't this year! If I'd gone on to one more round, I had two options...the story below, or Part 3 that I posted last week. I think I would have gone with this one to change it up a bit. He strained to hear them. His eyes were slits squinting in the direction of the sounds. He at last spied them. There was nothing between here and there. Nothing but space. And if it was done right, the gap would be quietly and quickly closed. The opportunity for escape would be nonexistent. He was a master - deft, adept, agile, quick, deadly. He’d been described in these terms by the survivors, though he’d always vanished before anyone could figure out who he really was. He quietly approached unobserved. Totally oblivious of the danger they were in, they just kept up their inane, incessant chattering. He was closer than they knew. Which would it be? There was one who was facing away from him; that would be easy. Or maybe the one facing him? The one almost looking right at him, but not seeing him. Fool. They were all fools. It made it easier thinking of them that way. His eyes honed in on the one looking in his direction. That would be the most fun - seeing the surprised look. Every muscle was taut in anticipation. He could feel the hairs rising. He liked that feeling of chills crawling up his back. He instinctively crouched even lower, although he knew he hadn’t been spied. It would make the charge all that more powerful though. He felt himself twitching. It was uncontrollable and primitive, and seemed to start at the top of him and travel down, down, down to his feet until it seemed that the earth would tremble and give him away. They were all still there, but they kept moving and changing places. They were still engaged in whatever it was that they found interesting, but the one he’d selected had turned away. “Which one now?” He paused to look them over again, finally settling on a new object of interest. ”Yes, that one will do just fine.” He needed to be quick before they switched places again. The twitching became barely perceptible from the outside, more of an excited vibration. The crouching was lower. He could feel his chest touching his legs. Any lower and he’d be lying down. He sprang forward, baring claws and teeth, straight into the flock, glorying in the chaos of the chickadee frenzy. “Who was that foul feline?” one chirped from the safety of a high branch. “I don’t know, but he’s quick,” a gasping chirp came from another. “And bloodthirsty!” came a screech from a higher branch. “I will add that to my list of qualities...” He purred to himself as he shook the remaining black and white feathers from his mouth and began the long, methodical clean up.